Kyoto Sakura Tanka is a beautiful collection of poems and photographs that pays tribute to the ancient capital of Japan, Kyoto, during the cherry blossom (sakura) season. This unique book takes readers on a fascinating journey through Japan’s heartland, introducing them to subjects ranging from birds, bamboos and blossoms to omikuji, origami and shishi-odoshi, in settings ranging from canals and gardens to castles and temples. All the poems are written in a form traditional to Japan, an ancient poetic form known as tanka (or waka). 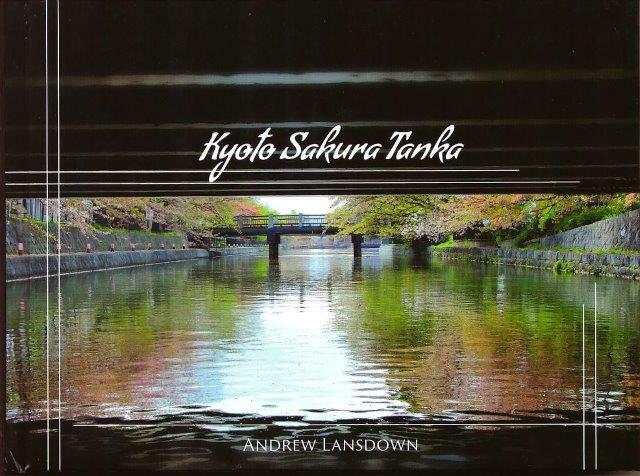 Kyoto Sakura Tanka is Andrew Lansdown’s fifteenth published collection of poetry and his first published collection of photography. in the temple cherry trees. also come to gaze and hum. wrote the world’s littlest poems. the lonely belling of stags? Through a series of visual and textual explorations, Andrew Lansdown’s Kyoto Sakura Tanka creates a striking depiction of the bicameral, separating his collection into kami no ku (the poet sees) and ashimo no ku (the poet wonders). The fundamental basis of Lansdown’s series is rooted in the Japanese tanka, or traditional waka: a five-line piece of poetry divided into mortas, or syllable counts, of 5/7/5/7/7. Yet, in this series, Lansdown once again takes up the themes of nature, transience and master Bashō’s doctrine of fueki ryūkō – ‘permanence and change’ – only to position himself against his chosen poetic tradition. Lansdown’s self-assigned task in this collection is twofold: he is disruptive to form and yet desires to remain meaningful. Notwithstanding bold innovation, Lansdown’s tanka captures the precision of haiku in its brevity while simultaneously preoccupied with fresh visions of the Imagist tradition as a means of cognitive exploration. Each poem takes the reader on a poetic detour of Kyoto, which furnishes new significance for this microcosm of Japanese culture and tradition. Of course, small details and Lansdown’s exquisite precision of language are not definitive, yet they are specific enough to keep abreast of fueki ryūkō as a necessary innovation to the waning presence of the tanka in contemporary poetics. where once other bamboos stood. falling with the load of itself. The ‘shishi-odoshi’ is an imperfect metaphor for the realisation that things are lost to us even as they are found, characterising the traditional subject of seasonal change and awakening thoughts of the transience in and of nature. This motion of ‘lifting’ and ‘falling’ is similarly presented as involutional, the motion from past to present, present to past, which thus allows the past of the classical tanka form and Lansdown’s contemporary poetry to embrace and inform each other in the dynamic immediacy of present vision. This is literally and figuratively realised in the accompanying photography. In this way, Lansdown’s poems offer an aesthetic ideal that uses the uncompromising touch of mortality in ‘Volcanoes’ to focus the mind; and, in ‘Off-Pivot’, to provoke a sharp, intuitive discovery in order to get the essence of life and fueki ryūkō, infused with tradition and abruptly disturbed by ‘the haunting hollow bamboo sounds punctuating the temple garden’ (‘Shish-odoshi Hauntings’). and my regard as witness. The result is a vision of human presence framed against an interfusional setting, that is, nature is not presented as an otherness distinct from Susan, but as a shifting perceptual field that is so ‘beyond white in purity’, that it is ‘quite beyond seeing’. This quiet process, whereby humankind and nature appear perfectly continuous and productive of each other, displaces consciousness into all things – human and inhuman – in such a way that cognitive and emotional qualities ordinarily belonging to the human are seen to anticipate an amorphous and embracive environmental unity of seeing and feeling. In unifying nature and the human, the marriage Lansdown celebrates is rooted in the Japanese concept of ‘furyu’, which literally means ‘in the way of the wind and stream’; Sakura and Susan presented as within a liminal zone, which the reader, as ‘Witness’, must occupy to realise Lansdown’s vision of the ‘Bride’. the last reflections of light. from the reader paper lantern? Lansdown identifies the natural as a vital continuum of interactive forces within the tanka. The ‘still water/ of the stone basin’ cannot be viewed as something other than fish, and the ‘Fingerlings’ of ‘fire burning’ colour cannot be viewed as anything other than pertaining to the ‘red paper lantern’. This personification imbues the photograph with motion to form a still point of oceanic calm and penetrating insight. In between these lines, a quiet listening in anticipation, a kind of potential action on the brink of realisation unfolds, as the reader waits in suspense of the Japanese Maples flourishing. While this poem creates a pleasing image, it’s Lansdown’s precision of syntax and perception of the places he dwells that stays with the reader, the intimate qualities of a diary laid bare through his visual journal. As each poem progresses, it feels natural to connect each photograph with the intended poem; each sequence linked by the subtle colours present in the image and reflected on the neighbouring page. ‘To Their Surprise’ is just one of the instances where this symbiosis advances the text’s tranquillity and elegance, the subtle shift between the kami no ku to ashimo no kubeautifully realised in the poet’s observation of the visual and sky blue reflected on the adjacent background. to become a Buddhist monk? or perhaps purely a heron? across the stone basin’s rim. This poem describes in the most pragmatic terms the way the poet and the poem form a relationship, and is beguiling in its mysterious ability to evoke essential connection, sometimes not necessarily for the better, as the water ‘cannot pass on the flow’. Taken together, these cadences concentrate each line of Lansdown’s ‘Imagine’, bringing every word and its allusions into focus and opening up his poem as an accessible Kyoto that is gradually expanding. more to Issa than Basho. The image and poem conflate into an act of philosophical perception; the culmination of the turtle riding one’s back presents a jocular regress to life’s transience and the problem posed by the ‘unmoved mover’ paradox (‘it’s turtles all the way down’). Essentially, the poem suggests it’s Basho and Issa all the way down, Lansdown unintentionally working himself out of the hierarchy, but eternally in pursuit of a place within it. and the wild sparrows play rough! Yet, if it has been Lansdown’s intention to inspire fueki ryūkō and encapsulate Wabi Sabi, then he has been successful, but perhaps to a degree near on saccharine. It is poetry which easily moves between subjects and awakens the world of invisible spirits where cherry blossoms come alive and humans have the power to morph with nature – but it lacks the unexpected and falls into formulaic poetic devices such as couplets and juxtapositions. 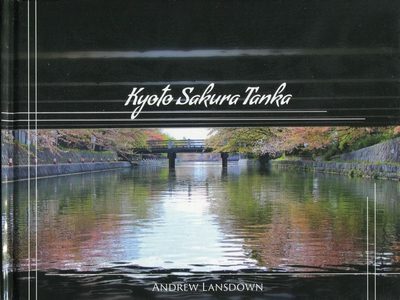 Kyoto Sakura Tanka is Andrew Lansdown’s 15th published collection of poetry and his first published collection of photography. It is an elegant publication, in a beautifully crafted hardcover edition, which makes it an ideal gift. Even more so, because the contents were created by one of the finest poets in Australia. I have fond memories of his previously published books of poetry. His 1996 book of poems and stories, Abiding Things, has an early touch of Japan with the first poem, The Japanese Gardener. But the five-line lyric tanka poem of Japan, which has since become a fascinating adventure for him, had not then grabbed his attention. In his beautiful book, The Grasshopper Heart, published in 1991, he moved closer to Japan with Five Haiku. On the blank page before the contents, he arranged five lines from Isaiah 55:12, which in my limited ability to judge seems to come close to a tanka. In Kyoto Sakura Tanka, Lansdown soars to new heights. Not only is the book a delight to read, but his scholarship adds great value. The book should be in all school libraries. as if unburdened with care. The poem Kyoto Autumn Maples, which is a sequence of six tanka, won the Melbourne Poets Union International Poetry Prize.